About an hour and a half into Incendies, I wanted nothing more than to sneak a quick glance at my phone to check the time. 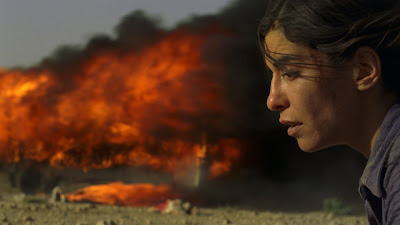 Usually this urge derives from great boredom, but in the case of Incendies, it was quite the opposite. You see, Incendies is so intricate, so elaborately conceived and seamlessly executed, that I didn’t think it was possible for the film to conclude in any coherent manner with its remaining 30 minutes. So, I wasn’t checking the time in anticipation of leaving. I was checking the time, hoping the movie would continue on for hours. That’s really the best compliment I can give to a film. Twentysomething twins Jeanne and Simon are read the will of their mother, Nawal. The will contains a few requests, most of them laminated with angst. Chief among those requests are two sealed envelopes. One envelope, the will tells us, is for Jeanne to deliver to the twins’ father. The other envelope is for Simon to deliver to their brother. Problem is, their father died before they were born, and they’ve never heard of said brother. No additional details are given. Jeanne’s confusion is temporarily outweighed by Simon’s spite, but she soon leaves her native Canada for the Middle East, in search of the father she didn’t know she had. That’s an intriguing enough plot to entice most any moviegoer, but director Denis Villeneuve, working from Wajdi Mouawad’s play, pushes it further. Throughout the film, Jeanne’s journey is crosscut with her mother’s story, lending itself to several thoroughly detailed narrative tricks. So, for instance, we see the story of why Nawal was outcast from her family, and how she later became a political prisoner. None of this, it seems, is known by Jeanne or Simon, so when they hear of the many unfortunate events their mother endured, they’re hearing it for the first time, even though we, the audience, have already seen it in Nawal’s story. But this isn’t always the case. Sometimes, we discover bits of information in Jeanne’s story and jump back in time to see the event play out in Nawal’s life. If this sounds confusing, that’s because it is on the surface. But due to Villeneuve’s seamless script and Monique Dartonne’s smooth editing, we’re never once bogged down by plot holes or confusion. Despite its intricacies, Incendies flows perfectly. The film, at its core, is a series of revelations. Many times, the characters in the film receive shocking news that rocks them to the core. It’s in these moments that Incendies deserves to be hailed as a great film. It would be common for actors Lubna Azabal, Mélissa Désormeaux-Poulin, Maxim Gaudette (who play Nawal, Jeanne, and Simon, respectively) to lash out and rage rage against the dying of the light from such harsh realizations. But they don’t. They keep it in. Maybe a tear falls, maybe a jaw drops. Would you cry upon hearing news that could completely curb the person that you thought you were? Now for a story. When Incendies was finished, I, like the other 22 people in the theatre with me, remained seated through the credits. I can’t speak for anyone else, but I was too stunned to form a rational thought, let alone move from my seat. I eventually found myself exiting the theatre, and walking outside into the magic hour dusk. I wandered around for a while, my mind completely adrift. A few minutes later, I checked the time and noticed that the movie had ended an hour ago. What had I been doing for the last 60 minutes? Time was completely lost. This rarely happens to me. I’m, usually, perfectly capable of watching several films in one sitting. I’ll even clock in two or three flicks at the theatre, completely able to turn off one film to make room for another. The last time a film hit me this hard – to the point of literal lost time – was when I walked out of There Will Be Blood, stuck in a daze, like I’d just stumbled my way out of a bar fight. thanks for adding the preview and showtime links at the end of the article. too bad this movie is nowhere near me. just curious, why don't you add those links to every blog post? Movies like Incendies and Beginners and The Double Hour need all the help they can get. If my gushing about them isn’t good enough for you (which is completely understandable), I’m hoping the trailer will help hook you enough to travel an hour+ to catch it at an indie theatre. X-Men: First Class and Super 8 and The Hangover II and Thor don’t need any help. I assume that most people have already seen those trailers and most people probably live within walking distance of a theatre playing them. All of cinema is a fine place, and the indies are worth fighting for. I agree with the second part. makes sense. thanks for highlighting the indies! also... was that a Hemingway/Seven reference?